The phenomenon of metaplasia, in which one tissue type is converted into another, is beginning to be explained in molecular terms. The transformation of lung to intestinal tissue has not previously been described, but it is now reported that it can be brought about by prolonged Wnt signaling in late development. The transformation of one tissue type to another, a process called metaplasia, is a fascinating aspect of both pathology and developmental biology. Metaplasias represent the homeotic transformations of vertebrates, comparable to the homeotic mutations in Drosophila that can transform antenna to leg or wing to haltere . Of particular developmental interest are cases where tissues are transformed to other types that normally occur elsewhere in the body, as for example in the formation of intestinal tissue from the esophageal epithelium in the condition known as Barrett's esophagus . Both the intestine and the esophagus arise from the endoderm of land vertebrates, which starts out as a simple sheet, or tube, of cells that becomes a series of epithelial tissue types; these are, arranged roughly from cranial to caudal: esophagus, trachea, bronchi, lungs, stomach, liver, pancreas, small intestine, and colon. 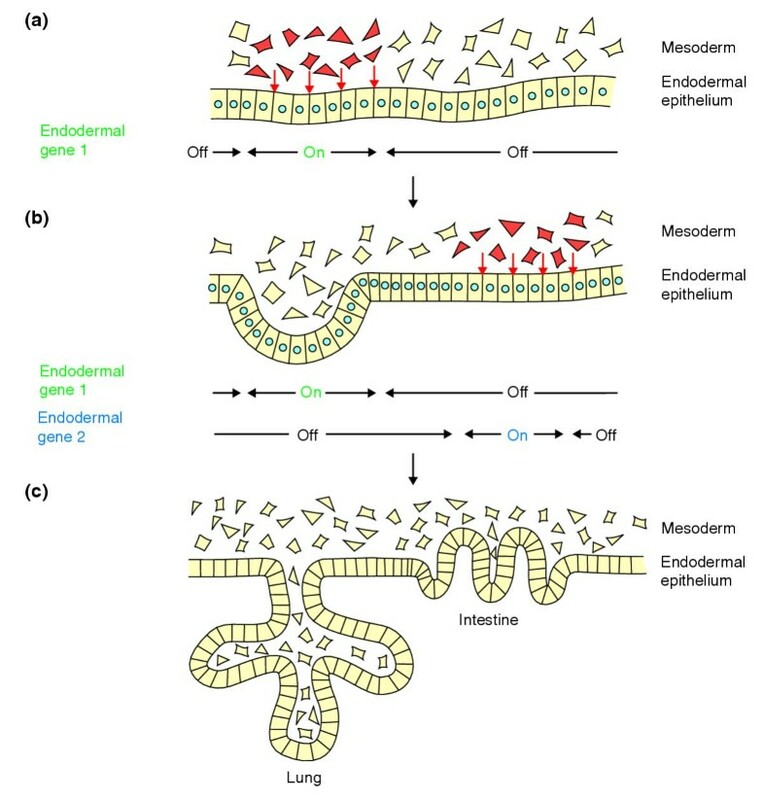 These epithelia arise in different places because of distinct inductive signals from the mesoderm that is associated with the endoderm in different locations . (The endoderm and mesoderm are the inner and middle two, respectively, of the three original cellular layers of the vertebrate embryo from which the adult tissues arise.) The ultimate source of the positional information in the mesoderm may be the pattern of expression of Hox genes, which is set up in early development, but this is not yet certain . It has become a well-established principle of developmental biology that the identity of a tissue type is specified by the combination of transcription factors activated during embryonic development. Only a small subset of transcription factors is involved in this process, acting combinatorially to form developmental 'codes' that correspond to particular tissue types. If the genes encoding these factors are turned on or off inappropriately then the code is changed to that for a different tissue type and a homeotic transformation results . These genes are thus the ones usually described as homeotic genes, or selector genes or master regulator genes (depending on the organism of interest). For the endoderm-derived epithelia, each homeotic gene is normally active in only one region, so there is a correspondence between epithelial tissue type and body part, and the similarity between metaplasias and homeosis in Drosophila is quite clear-cut. Recently, some information has come to light concerning the molecular basis of certain metaplasias. For example, the transcription factor Cdx2 is normally expressed in the intestine but not the stomach; but ectopic expression in the stomachs of transgenic mice gives rise to patches of intestinal tissue . Conversely, the loss of Cdx2 expression from the intestine gives rise to ectopic patches of esophagus-like squamous epithelium . Likewise, the transcription factor Pdx1 is normally expressed in the pancreas but not the liver, and ectopic expression of an activated form of this factor in Xenopus tadpoles can transform parts of the liver into pancreas . These examples do not simply relate to reprogramming of embryonic tissues before their fate has been determined, as they result from ectopic gene expression in late development, after the different transcription factor codes have already become established. The paper by Okubo and Hogan  in this issue of Journal of Biology describes a novel type of metaplasia: in which excess activity in the Wnt signaling pathway in the lung epithelium leads to a transformation towards an intestinal cell fate. The lungs normally develop as paired ventral outgrowths of the foregut endoderm . These buds undergo repeated branching as they grow, and eventually they differentiate, from proximal to distal, into the epithelium of the trachea, the bronchi, and the lungs themselves. The primitive respiratory epithelium is a simple columnar type. As it differentiates, the trachea and bronchi develop a lining that is pseudostratified and ciliated, with goblet (mucus-secreting) cells and some submucosal sero-mucous glands, both becoming less frequent distally. The terminal bronchioles are lined with cuboidal ciliated cells and non-ciliated Clara cells, which secrete components of the pulmonary surfactant. The alveoli are composed of type 1 pneumocytes, which are large and flat, making up most of the respiratory surface, and the more numerous type 2 pneumocytes, which are rounded cells secreting the remaining components of the pulmonary surfactant. Okubo and Hogan  made transgenic mice in which the Wnt signaling pathway was constitutively activated in the lungs of the late embryo. The promoter used was that for the surfactant C gene (Sftpc), which is active in the early lung buds and later in the type 2 pneumocytes. The transgene product, CatCLef1, was a fusion protein of the signal transducer β-catenin and the transcription factor Lef1. Normally Wnt signaling stabilizes β-catenin, enabling it to enter the nucleus and combine with transcription factors of the HMG family, including Lef1, in order to activate target genes . The CatCLef1 fusion protein shows a constitutive gene-activation activity, independent of Wnt signaling. In the resulting transgenic mice the alveoli of the lungs are quite abnormal, being composed of large air spaces lined with highly proliferative cuboidal epithelium. Remarkably, this epithelium contains cells resembling differentiated types normally found in the intestine rather than the lung. In particular, many cells express the basic helix-loop-helix (bHLH) transcription factor Atoh1 (also known as Math1), which is normally associated with the non-enterocyte lineages of the intestine . Some cells resemble the Paneth cells found at the base of small intestinal crypts, expressing mRNA for defensin related cryptdin 6. This is an interesting result, as it may be the first example of intestinal metaplasia in the lungs. The authors  draw attention to the similarity of this process to transdetermination in Drosophila, the phenomenon whereby cultured fragments of imaginal disc - epithelial infoldings in insect larvae that develop into specific adult appendages - can switch identity and become a different type of disc. This can also be provoked by ectopic expression of Wingless, the Drosophila homolog of the mammalian Wnt proteins . The cellular and molecular basis of the lung-to-intestine effect is not yet clear, however. We should like to know whether there is a small group of transcription factors whose expression distinguishes lung and intestine, and whether they are normally activated by Wnt signaling in the intestine and not the lung. Possible candidates might, for example, be the factor TTF1 (thyroid transcription factor 1), which is thyroid- and lung-specific , and Cdx2, which is intestine-specific . There are numerous different Wnt factors normally expressed in the developing gut and respiratory system, some in the mesoderm and some in the endoderm itself . The endogenous Wnt signaling pattern can be visualized using a reporter mouse: the TOPGAL line, in which β-galactosidase expression is driven by Wnt-responsive elements . This shows that there is normally Wnt signaling in the early lung buds, with a concentration at the distal tips of branches during outgrowth. Interestingly, the article by Okubo and Hogan  shows that there is not Wnt signaling in the intestine in the mid-gestation period, although Wnt signaling is known to be necessary for maintaining proliferating cells in the intestine postnatally . The behavior of the TOPGAL reporter in the Sftpc-CatCLef1 mice indicates that it may be an abnormal prolongation of Wnt activity that is important in this case. The actual timing of the effect, and the nature of the critical transcription factors involved, remains to be established, but Figure 1 shows a possible model outlining events occurring in the transgenic lung. Here, Wnt signaling activates expression of one key transcription factor in the prospective lung bud, and, at a later stage, another in the prospective intestine. If both are activated by prolonged Wnt signaling then a mixture of intestinal and lung cell types may arise. A highly schematic model of normal development to explain how the observed transdetermination might occur in the lungs of transgenic mice expressing a constitutive activator of Wnt signaling. (a, b) The mesoderm associated with the endodermal epithelium normally emits Wnt signals in two regions, at two different times. (c) Because the competence of the endoderm - its potential to form different tissues - changes during this period, this results in the activation of different homeotic genes, and the formation of different tissue types. But artificially prolonged signaling would activate both homeotic genes, with unpredictable consequences that might include the formation of cell types belonging to both tissues. Okubo and Hogan  describe their phenomenon as 'transdetermination', using the Drosophila terminology. This makes good sense as it probably does occur in late development when the lung epithelium is committed to be lung but is not yet differentiated. In the pathological literature such changes are described as 'metaplasias' if they arise in postnatal life, and 'heterotopias' if they arise in embryonic life, although it is often difficult to be sure of the timing from a single preserved specimen. An additional term, 'transdifferentiation', was introduced by Okada  to cover cases where there was evidence of a direct transformation from one differentiated cell type to another. In recent years 'transdifferentiation' has been extensively used in connection with the controversy over whether bone-marrow stem cells can colonize other tissues after transplantation . Apart from not conforming to Okada's definition because of the undifferentiated character of the cells involved, this controversy has ended up generating great skepticism that cell-type transformations can occur at all. But it would be unfortunate if the unreproducibilility of some of the bone-marrow transplantation experiments were to obscure the real importance of understanding the molecular basis of metaplasias in pathology and biology. Okubo and Hogan have taken us one step along this important path.